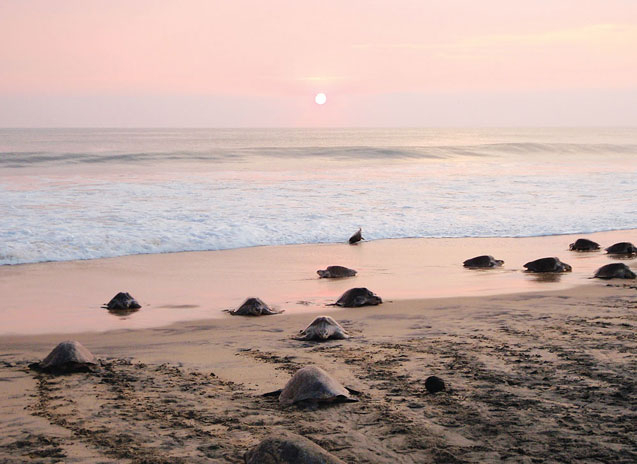 Beneath a sliver of moon in the night sky on the Oaxacan coast, hundreds of Olive Ridley sea turtles emerge from the surf, crawling steadily up the wet sand. 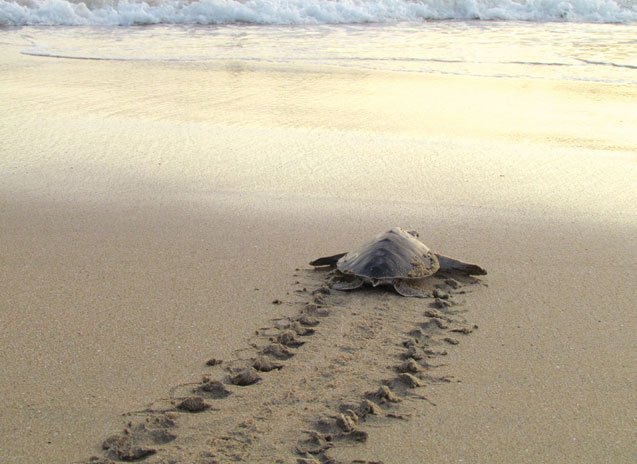 They’ve navigated a complex migratory route over thousands of miles of ocean, without visual landmarks, to lay their eggs on the beach where they were born. Witnessing this natural spectacle is one of the world’s most impressive sights. And it’s all happening a short drive from Puerto Escondido. Here’s what you need to know about sea turtles in Oaxaca. 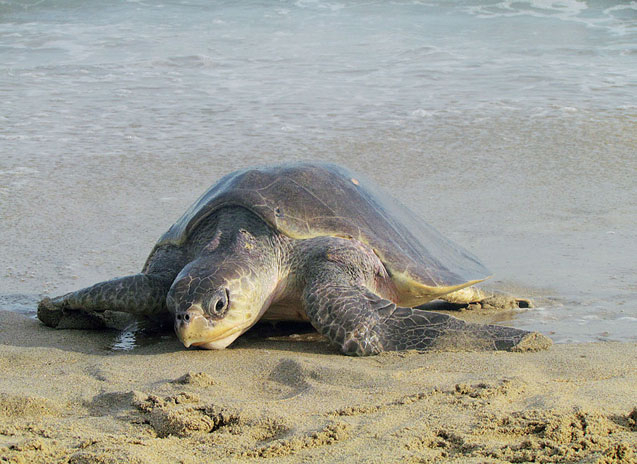 “Mexico’s Oaxacan coast is one of the world’s top five turtle nesting areas,” says Dr. Eduardo Nájera Hillman, Director of COSTASALVAJE (WILDCOAST – Mexico), a partnership-based international organization that conserves coastal and marine ecosystems and wildlife. Due to the significance of Mexico’s Pacific coast sea turtle population, including Leatherbacks (laud), Green/black (prieta/verde), Hawksbill and Olive Ridley (golfina), they recently began working in Oaxaca. Nesting sites offer a rare opportunity to see marine turtles in the wild. Sea turtles are solitary creatures, remaining submerged for most of the time they are at sea, rarely interacting with other turtles except during mating. 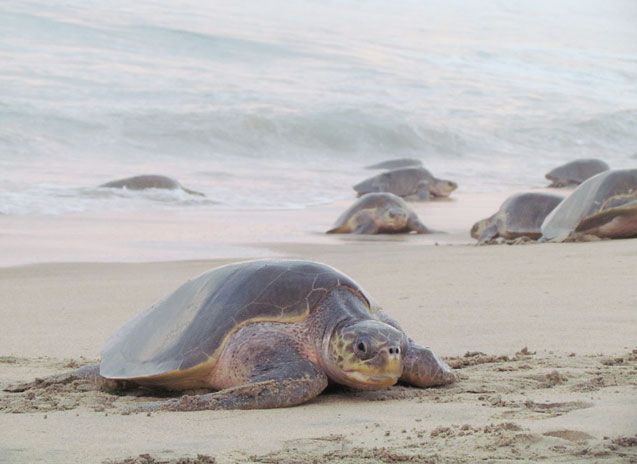 Major nesting beaches include La Escobilla, Mazunte, Morro Ayuta and Rio Seco but turtles also nest at other locations along the Oaxacan coast including Playa del Palmarito west of Puerto Escondido. Timing is important if you’re planning to see turtles nesting or hatching. 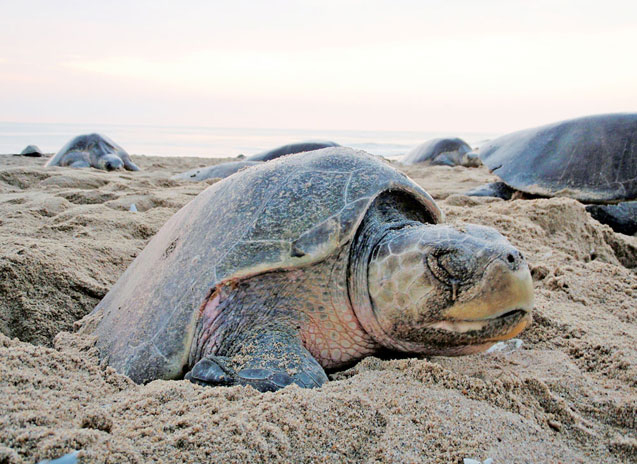 Prime season is between July and January when Olive Ridley turtles come ashore to lay their eggs in mass nestings known as arribadas. 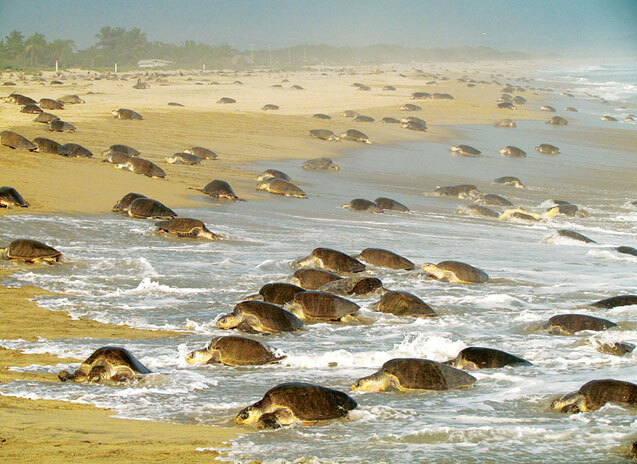 An arribada or arrival event is declared when 1,000 turtles or more are nesting on the beach. An arribada can last five days and involve up to 90,000 turtles. How can you increase your chances of witnessing such a monumental event? Ideal conditions for an arribada include high tide, a waning moon, clear waters and brisk offshore winds. The Olive Ridley nesting process begins when the female emerges from the ocean before dawn and crawls up the beach to dig a deep hole known as a “body pit” with her flippers. Once the nest depression is prepared, she begins the laborious process of laying up to 100 individual eggs in the nest. She then covers the eggs with sand and returns exhausted to the ocean. During the next 45-70 days, the hatchlings grow and consume oxygen within the eggs, hatching simultaneously when oxygen levels get critically low. The position of the egg within the nest determines the gender of the turtle. If the incubation temperature is greater than 29 Celsius, the turtle will become female and below 29 Celsius it will become male. Only 50% of the eggs will hatch. The tiny hatchlings, weighing only 1 ounce (29 grams) each, emerge from their shells in the early morning and, guided by light reflecting off the ocean, scurry to the sea, imprinting in their memory important markers to remember their birthplace. Female turtles will return to the same beach to nest as adults. 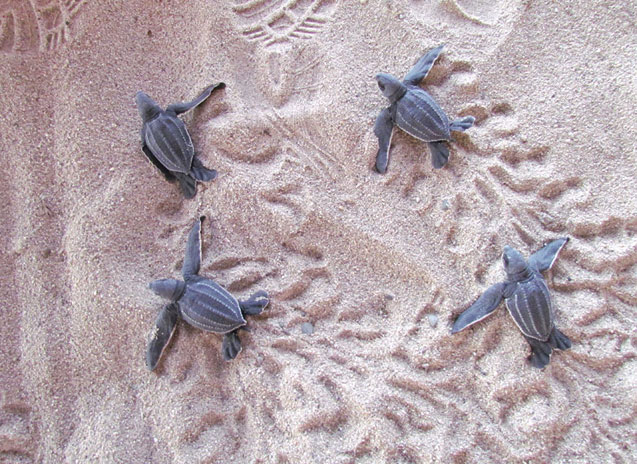 For baby turtles, making it to the sea is much like running a gauntlet. They must ignore artificial lights luring them away from the ocean and avoid animal predators, human poachers and natural obstacles such as overpowering surf. If they are lucky enough to make it to the ocean and latch onto some sea algae they may survive to become juveniles. Experts estimate only 2% of hatchlings make it to adulthood. With so many obstacles to survival, it may seem the odds are stacked against turtles. In fact, until the Mexican government banned turtle hunting in 1990, virtually all species of marine turtle were under threat. Since then, the population of Olive Ridley turtles is on the rise thanks to recovery efforts by Mexico’s National Commission of Natural Protected Areas (CONANP), the Mexican Turtle Center (El Centro Mexicano de la Tortuga) in Mazunte and several non-government organizations. Working with local communities, they focus on surveillance, monitoring hatching productivity, data collection and education. “It is too early to assess the full impact of conservation efforts as much of the turtle population studied has not yet reach breeding age,” says Dr. Nájera Hillman. Olive Ridleys reach sexual maturity around 15 years and they share dangers facing all marine turtles including illegal poaching of turtle eggs, habitat destruction, encroaching beach development, oil spills, long line fishing and climate change affecting food sources, weather patterns and ocean temperature. It will take sustained vigilance, support and cooperation by the public, local communities, all levels of government and private industry to make lasting change. By working together we can help ensure that future generations will have an opportunity to enjoy the life-changing experience of witnessing a sea turtle nesting event.